The 2016-17 season opener, the Nike Golf Collegiate Invitational is an instant classic being held at the famed par 70 Colonial Country Club, known as Hogan's Alley, including an elite field of 15 teams. Leading the way for Stanford is the world's top ranked amateur, Maverick McNealy, who starts his senior season after two consecutive All-American campaigns. McNealy is joined by juniors Franklin Huang and Bradley Knox, sophomore Brandon Wu and freshman Henry Shimp. 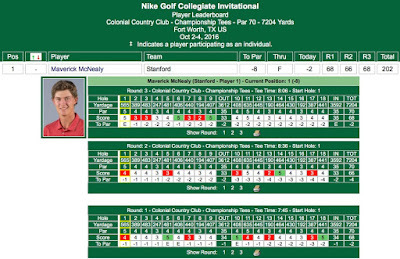 It was an historic final round at famed Colonial CC for Maverick McNealy as he won his school record tying 11th college tournament on rounds of 68-66-68 202, beating the field by 2 shots with his 8-under par total. His win ties Maverick with Tiger Woods and Patrick Rodgers for the most ever career wins by a Stanford men's golfer. Maverick's three scorecards are included below - click on image to enlarge. 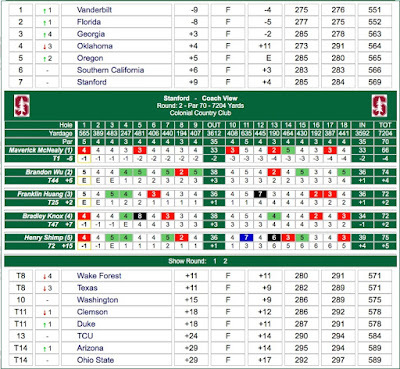 Stanford finished tied for 6th with USC, 21 strokes behind Vanderbilt and one behind Oregon. Franklin Huang tied for 28th on rounds of 70-72-74 216, Brandon Wu tied for 30th with his 72-74-71 217, Bradley Knox tied for 57th with 75-75-79 229 and Henry Shimp finished 73rd on rounds of 80-75-78 233. 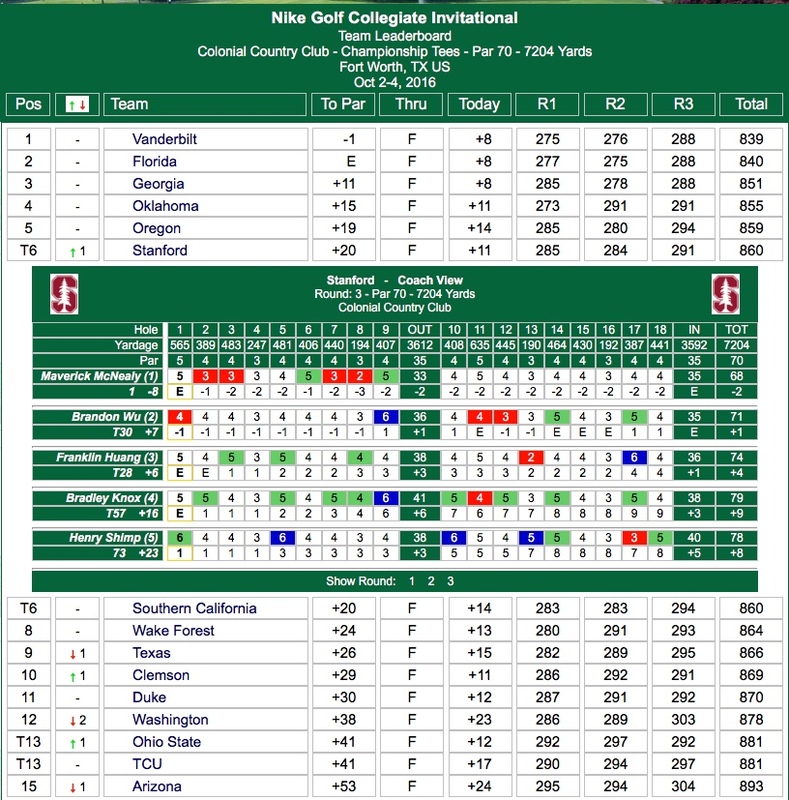 Click below to view the final team standings and round 3 scorecards for Stanford. FORT WORTH, Texas – Maverick McNealy earned his 11th career victory Tuesday, matching the Stanford record shared by PGA Tour professionals Tiger Woods and Patrick Rodgers. In his 2016-17 season debut at the Nike Collegiate Invitational, McNealy (68-66-68) was the only player with three consecutive rounds under par at Colonial Country Club, two shots better than Oregon’s Wyndham Clark. He helped the Cardinal tie for sixth with USC among the 15-team field. “The Nike Collegiate Invitational was a great way to open the season,” said Conrad Ray, Stanford’s Knowles Family Director of Men’s Golf. “The guys learned a lot about their games on a championship track. McNealy, the world’s top-ranked amateur, earned the victory against a stacked field. Three of the teams who reached the semifinals of the 2016 NCAA Championships competed in the event, including defending national champion Oregon and runner-up Texas. McNealy used 14 birdies against six bogeys for his 8-under 202. He was 2-under through 18 holes, and then went 4-under through his next 13, en route to posting a second-round 66. That score lifted him eight spots to share the individual lead heading into the final circuit. In his final round, McNealy birdied four holes on the front nine while bogeying a pair. He finished with nine straight pars. 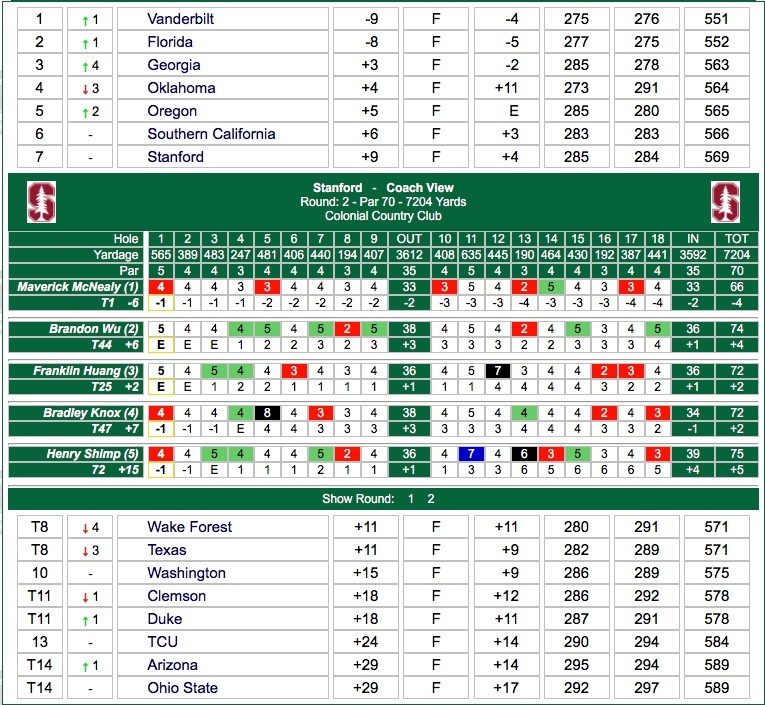 Stanford (+20) went 285-280-294 through 54 holes on the par-70 layout. Franklin Huang (70-72-74) tied for 28th, Brandon Wu (70-72-74) tied for 30th, Bradley Knox (75-72-79) tied for 57th and Henry Shimp (80-75-78) was 73rd in his collegiate debut. The Cardinal resumes the fall portion of its season Oct. 21-23 at the United States Collegiate Championship in Alpharetta, Georgia. 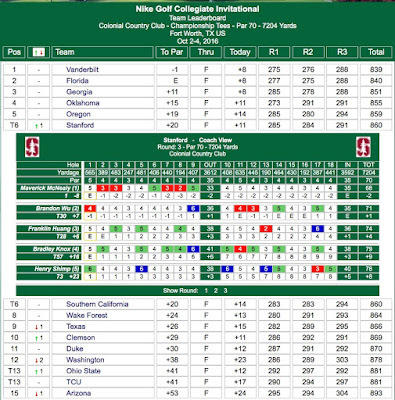 Stanford posted a 4-over 284 total in round 2 and remained in 7th position, 18 strokes behind Vanderbilt, on rounds of 285-284 569. Vanderbilt at 9-under par 551 and Florida at 8-under 552 have separated themselves from the field, as third place Georgia is 3-over par at 563. Once again Maverick McNealy led the way with a tournament tying low round of 66 (68-66 134 T1) to tie for first individually at 6-under par. Franklin Huang shot a 72 (70-72-142 T25), Brandon Wu shot a 74 (72-74 146 T44), Bradley Knox a 75 (75-75 150 T47) as did Henry Shimp (80-75 155 72nd). Round 2 Team & Stanford scorecards can be found below. Stanford finished tied for 7th after the first round at 5 over par, 12 strokes behind the leader Oklahoma. The Cardinal was led by Maverick McNealy's 2-under 68 that left him tied for 9th individually, 2 strokes behind the lead, in a round that included 5 birdies and 3 bogeys. Franklin Huang followed with a 70, Brandon Wu with a 72, Bradley Knox with a 75 and Henry Shimp with an 80. Team and Stanford scorecards can be found below - click to enlarge.